These blueberry pancakes are so easy to make that you'll never buy pancake mix from the store again! Perfect, fluffy blueberry pancakes and homemade syrup every time. My kids love blueberries! I’ll be honest, I have a little trouble eating blueberries unless they are cooked. Maybe it’s a texture thing? I’m not sure, but know they taste absolutely delicious in these pancakes and syrup! 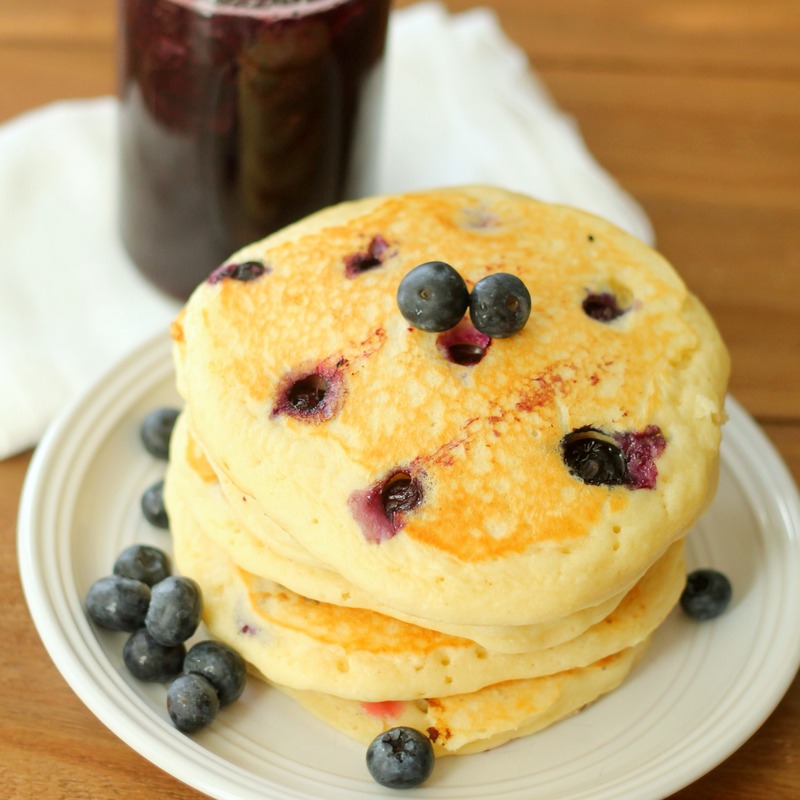 These blueberry pancakes are so much better than anything you can buy at the store! And just as good as any blueberry pancakes and syrup you can get at a restaurant. This is important because the best blueberry pancakes all start with perfectly plump, round blueberries! Look for blueberries that are firm, dry, and smooth-skinned. They should be a dark blue-purple (almost black) in color. While this recipe calls for fresh blueberries (and we think it tastes best with fresh blueberries), you can still use frozen blueberries if that is all you have on hand (or all your grocery store has to offer). When buying frozen blueberries, make sure they are not clumped together – they should feel loose in the bag. Before you use frozen blueberries, make sure they are thawed, rinsed, and drained well. In a separate bowl, whisk together milk, butter, and eggs. Add wet mix to dry mix and stir until just combined. Heat a griddle or large skillet on medium heat – approximately 350 degrees fahrenheit. Spray griddle or skillet with nonstick cooking spray. Spoon batter onto griddle or skillet using a 1/2 cup measuring cup and spread into a circle. Immediately sprinkle a few berries onto each pancake (don’t stir them into the wet mix or you’ll end up with broken berries and a purple batter). Cook pancakes for a few minutes on each side, or until golden brown. Top with homemade blueberry syrup. In a saucepan over medium heat, whisk together water, sugar, blueberries, and maple syrup and bring to a boil. Reduce heat to low and let simmer for 10 minutes or until the syrup starts to thicken. If your blueberry syrup isn’t thickening after 10 or so minutes (or if it just isn’t as thick as you’d like it), you can make it a little thicker by mixing together 1-2 Tablespoons cornstarch with 1-2 Tablespoons of water and adding it to the syrup, stirring constantly until it starts to thicken. These pancakes are so easy to make that you'll never buy pancake mix from the store again! Perfect, fluffy blueberry pancakes and homemade syrup every time. In a large bowl, whisk together flour, sugar, baking powder and salt. In a separate bowl, whisk together milk, butter, and eggs. Add wet mix to dry mix and stir until just combined. Heat a griddle or large skillet on medium heat (approx. 350 degrees F). Spray griddle or skillet with nonstick cooking spray. Spoon batter onto griddle or skillet using a 1/2 cup measuring cup and spread into a circle. Sprinkle a few berries onto each pancake. In a saucepan over medium heat, whisk together all ingredients and bring to a boil. Reduce heat to low and let simmer for 10 minutes or until the syrup starts to thicken. My family would go crazy for these! These are the best pancakes ever!! My family has begged me to make these at least 5 times this week. 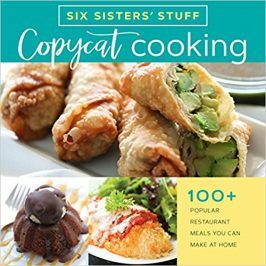 Thanks for the yummy/easy recipes. I had the same issue. Any suggestions?